"We are a London based design company, and our client is in Oklahoma. I didn't want to print in the UK and ship it all to the client, so instead I searched for a local printer in the USA. 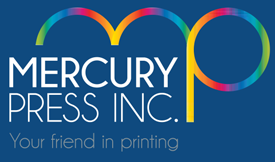 We came across Mercury Press Inc, I did all the checks in terms of cost, quality and service. I am super impressed at all three of the deliveries of our requirements. The client is over-the-moon, I couldn't be happier with the process. Richard Osborn, the President of MPI, gave us such quality service and attention to detail, helping us with sizing from the metrics system to inches. I now wish they would move to London so we can use them again!" "Thank you MPI team you have made a job - that could have been very difficult - very easy!" I agree. You did a great job. It is subtle and spectacular at the same time. I could not be more proud."